With the nights beginning to draw in and the temperature outside starting to drop Suffolk Police are advising residents to ensure their heating oil is kept safe this winter. Haverhill's history centre is part of a major regional historical project which has just beern awarded nearly £0.25million from the Heritage Lottery Fund. Listings of films showing or booking at Haverhill Cineworld for the week beginning Friday, October 11. Horticulture students from Castle Manor Academy and their teacher Mrs Baldwin, are celebrating achieving the highest award for school gardening from the Royal Horticultural Society. The main entrance road to Haverhill Research Park was officially opened today at a ribbon-cutting ceremony by the leader of St Edmundsbury Borough Council. A woman who died following a collision in Wickhambrook last night, has been named by police as Susan Tovey, 74, of Wickhambrook. Haverhill town mayor Cllr Roger André and deputy mayor Cllr Maureen Byrne joined members and volunteers at the LAMPH Halloween Party yesterday. The recent success of UKIP in Haverhill was continued in yesterday's town council by-election as the party took its first seat on the council at the expense of the Tories. Young people from across Haverhill and the surrounding villages gathered together on a windy Thursday afternoon, October 10, to take part in a cross-country competition. Haverhill Leisure Centre receptionist Ruth Bayne completed 'Perkins Great Eastern Run' half-marathon on Sunday, October 13, raising £450 for the Down's Syndrome Association. More than £20,000 in grants have been awarded to Haverhill youth projects by ONE Haverhill. St Edmundsbury is part of a partnership which has won an award for excellence in beating fraud. Listings of films showing or booking at Haverhill Cineworld for the week beginning Friday, October 18. Police are appealing for witnesses after a woman was struck by a car in Haverhill. The incident occurred at around 5.15pm on Tuesday, October 15, in Bumpstead Road. Latest figures released by the Department for Education show that Suffolk is climbing up the GCSE league tables and is closing the gap with the national average. Scouts from Kedington have proved themselves the best Scouts in the district, stripping Haverhill of the crown. Two of Haverhill's county councillors will be holding a joint surgery next Saturday, and it will again be crossing a party divide. Police with tasers were deployed in Haverhill High Street late on Friday night to deal with what had been reportedas a stabbing, but turned out to be an assault. Tickets are again being issued to offending motorists in the long-running battle over illegal pparking in Haverhill High Street. Police in Haverhill are appealing for information after a garage was broken into and two high-value bikes stolen from insiden. Just a couple of years after it was completed at a cost of over £5million, the New Clements Primary School is going to need major extensions to cope with predicted pupil number increases. Listings of films showing or booking at Haverhill Cineworld for the week beginning Friday, October 25. Haverhill Town Council is appealing for children all over Haverhill to donate their unemployed pumpkins for the 2013 Halloween Trail which is on Friday, November 1. Children will get the chance to carve pumpkins, make a spooky camp fire and take part in ghost hunting archery during a Halloween Survival Challenge at East Town Park in Haverhill. Police are appealing for information after two girls reported being followed in Haverhill. A new park was officially opened in Haverhill this morning. Haverhill has been mourning the passing of a councillor, former mayor and one of the central figures in the musical life of the town for half a century. 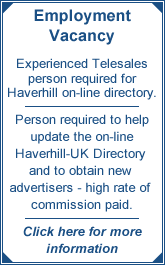 Haverhill police are seeking witnesses to a reported incident of suspicious behaviour in Teasel Close on Thursday, October 24. The team at Days Inn Haverhill were delighted to pass a recent audit of the hotel and its facilities with flying colours. The series of thefts of heating oil is getting closer to Haverhill. Haverhill largely escaped the ravages of the heavily-trailed St Jude storm overnight and this morning. Haverhill is not alone, it seems, in having a problem keeping illegal parking off its pedestrianised area. Police are appealing for witnesses after a burglary in Haverhill. The incident occurred between 5.50am and 3.10pm yesterday in Withersfield Road. Listings of films showing or booking at Haverhill Cineworld for the week beginning Friday, November 1. An area of Haverhill Business Park which has remained undeveloped for 15 years, despite all efforts to market it, may be given over for housing development if owners Carisbrooke can get approval. Town councillors held a minute’s silence in memory of former town mayor Cllr Les Ager before their meeting last night. A design for a new clock in Haverhill has received a very warm reception from town councillors, who are footing the bill.